The Library of the future is coming and it has no books! San Antonio has plans for a bookless library. The rendering is quite curious. 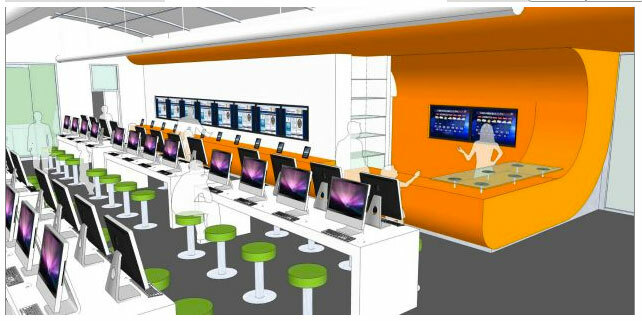 I love me some iMacs, but is the future of libraries really all the same computers? For some reason, I’d like to see a diversity of computers. I like how the single person sitting at the computer is staring at the Mac screensaver. In fact, all the computers have screensavers. Is that the future of libraries? I’d like to see some ebooks or websites on these computers. What is that on the back wall? Hopefully it’s something like staff picks. That would be so sweet to see staff picks displayed digitally on the wall. Actually, I’d like to see entire shelves of screens all displaying the ends of books. You walk along browsing, and then when something captures your interest, you tap on the book and it opens up. You can browse the book right in the aisle. And then if it interests you enough, you can tap something to add it to your lending card. That counter looks like a DJ booth. Wouldn’t it be rad if the librarian was like a DJ? Mixing some phat beats… or phat books. Clipping phat articles. Oh yeah! Go go DJ go! Go go DJ go! The library of the future still has physical shelfs. That’s weird. Or maybe the shelf is meant to hold ipads, ipods, and various cords. The library of the future has guillotine-style doors. It looks like this door drops from the ceiling down to the floor. It’s kinda like Star Trek, except it’s more deadly. I’d like to see the library of the future have more of a friendly type of door. The stool seating doesn’t encourage patrons to stay very long. What about going to the library and spending time with a book? Ok, so there are no books in this library, but why not spend time on the computer? Do you think the library of the future will have any plants?